In December, the Academy hosted the Commissioner’s Medical Grand Rounds Ebola: Past and Present panel discussion. In conjunction with this event, the Center for History prepared a small exhibition on the history of cholera in New York City. Cholera first reached New York City in June of 1832. Three thousand New Yorkers died within weeks, while an estimated one third of the city’s 250,000 inhabitants fled. The disease hit the working class neighborhoods of lower Manhattan the hardest. Many city officials implicated the residents of the poorest neighborhoods for contracting cholera, blaming their weak character, instead of viewing the epidemic as a public health problem. Competing notions of the cause of the disease’s spread impeded effective response to this initial outbreak. John Snow’s research, tracing the spread of cholera to contaminated water in London, was made public in 1855. Snow’s work, combined with the establishment of the New York Metropolitan Board of Health in 1866, did much to curb the last significant outbreaks in the city, in 1866 and 1892. [Scrapbook of Clippings]. Official Reports of the Board of Health during the Cholera, in the City of New York, in the year 1832. The first case of cholera in New York City was reported on June 26. 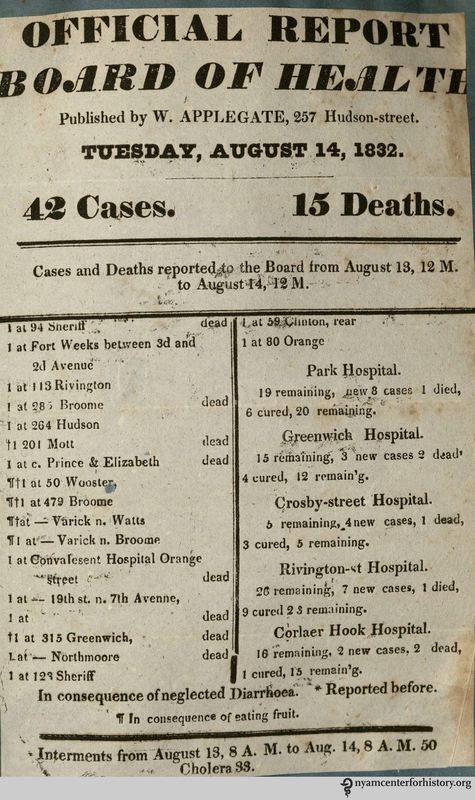 A scrapbook collection of broadside reports, spanning July 8–August 23, documents the catastrophic results of that first summer’s outbreak. The street addresses and the number of dead at each address are given, as well as the number of new cases and the number convalescing in hospitals at Park Street, Greenwich Street, Crosby Street, Rivington Street, the Alms-House, and elsewhere. Batchelder, J. P. Cholera: Its Causes, Symptoms, and Treatment, considered and explained. New York: Dewitt & Davenport, 1849. The 1832 arrival of cholera in the United State inspired a host of publications by physicians about the disease. By 1849, many New York physicians had accepted that cholera was “portable,” if not contagious. 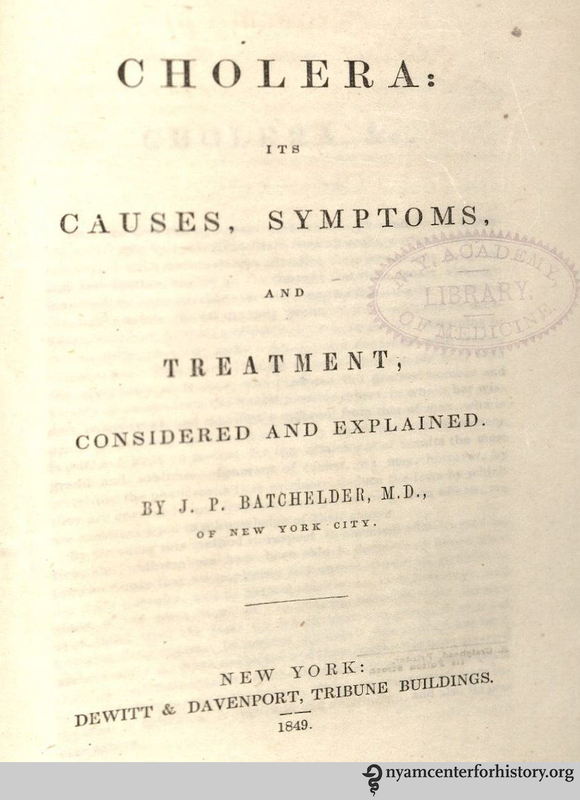 This pamphlet, by the eminent New York lecturer and surgeon J. P. Batchelder, documents a moment when the medical community was studying the spread of epidemic diseases in earnest, but the science was not yet understood. In a section on causes, Batchelder enumerates a long list of populations susceptible to the disease, including those suffering from hunger and those exposed to the night air. Our copy of this pamphlet was presented by the author to the Academy, and bears the Academy’s early bookplate. 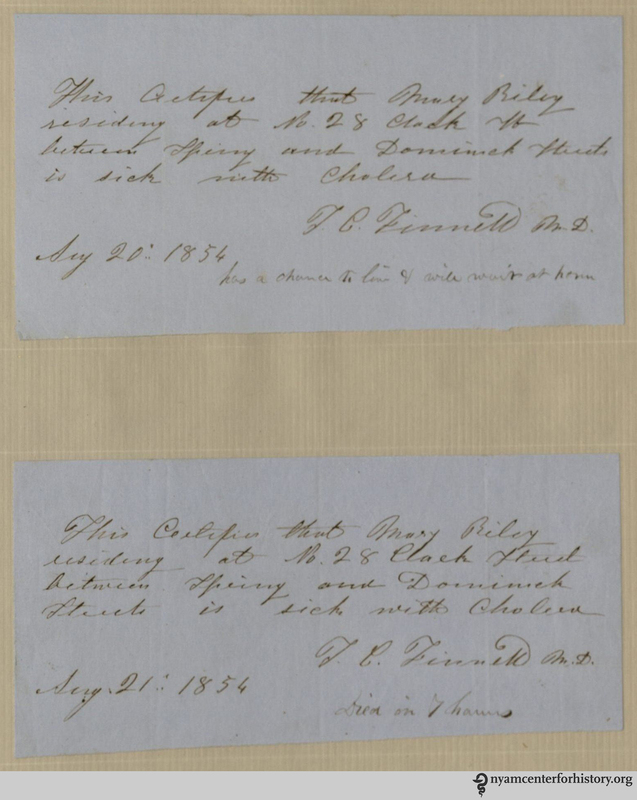 Collection of manuscript notes, related to the 1854 cholera epidemic in New York City. The second major outbreak of cholera in New York occurred in 1854, when the disease again reached epidemic proportions, killing 2,509. The Board of Health established temporary hospitals throughout the city to accommodate the large number of patients. This volume contains 27 orders for hospitalization during the epidemic of 1854, most of them hastily written on scrap paper. According to the notes, this patient, Mary Riley, delayed going to the hospital and died the following day at home. 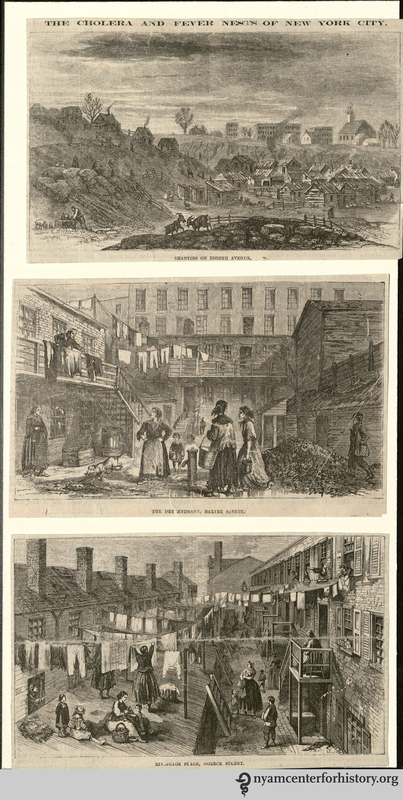 “The Cholera and Fever Nests of New York City.” Illustrations from the Healy Collection. 1866. “The Cholera and Fever Nests of New York City.” Illustrations from the Healy Collection. 1866. Click to enlarge. Peters, Dr. John C. “Routes of Asiatic Cholera.” Harper’s Weekly [New York] 25 April 1885. Illustration from the Healy Collection. Peters, Dr. John C. “Routes of Asiatic Cholera.” Harper’s Weekly [New York] 25 April 1885. Illustration from the Healy Collection. Click to enlarge. 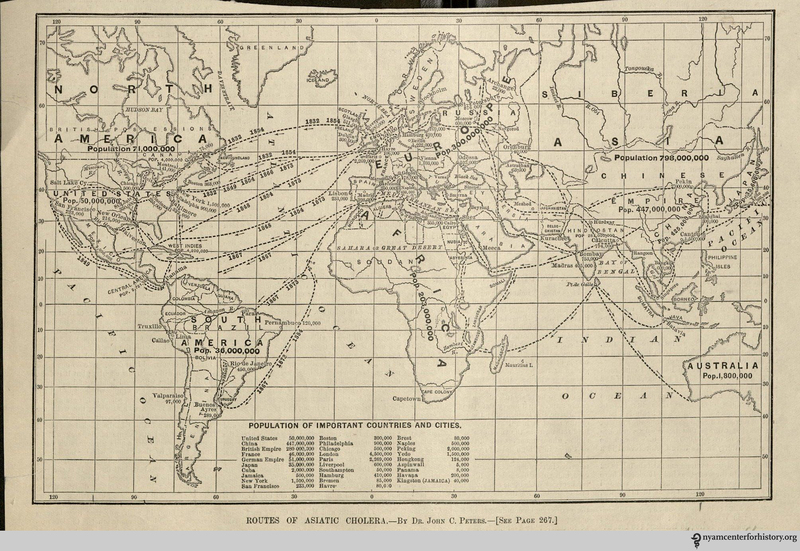 New York physician John C. Peters produced several informative maps showing the movement of cholera across the globe. This map, originally published in 1873, tracks the path of cholera from its origins at the mouth of the Ganges to Europe and on to the Americas. Visible on Peters’ map are the five major 19th-century routes of the disease into New York, in the years 1832, 1849, 1854, 1866, and 1873. 1. Documents of the Assembly of the State of New York, Volume 4. 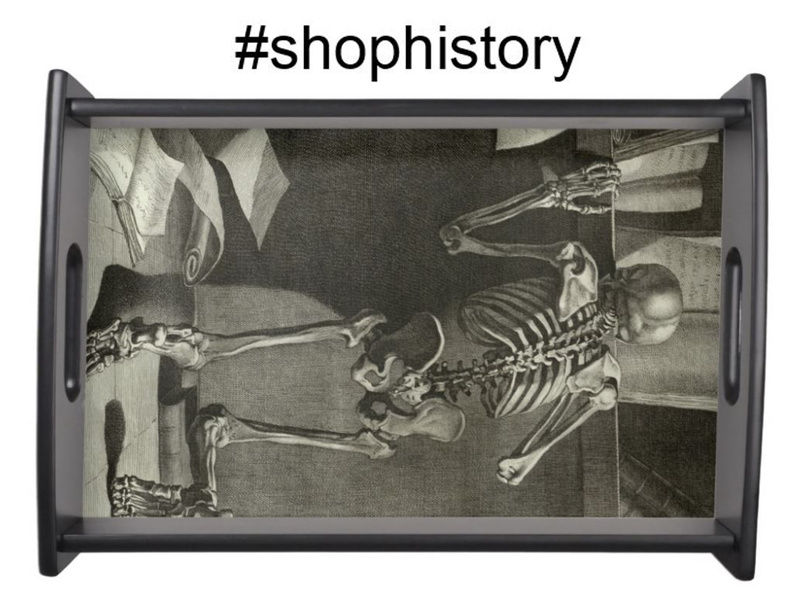 Accessed December 23, 2014, at http://bit.ly/1CwL7Kd.